Top-down pressure for marketers to prove ROI is on the rise. However, CMOs are unsure of how to calculate ROI for marketing activities and quantify their business impact. Every marketer needs to be able to prove their return on marketing investment and tie their efforts to revenue and other business outcomes. When it comes to figuring out how to calculate return on investment, the challenge lies in identifying and tracking the multiple variables that can impact marketing results. Here we’ll look at how to calculate ROI for marketing activities, taking into account three often forgotten factors that will help you better assess campaign impact. 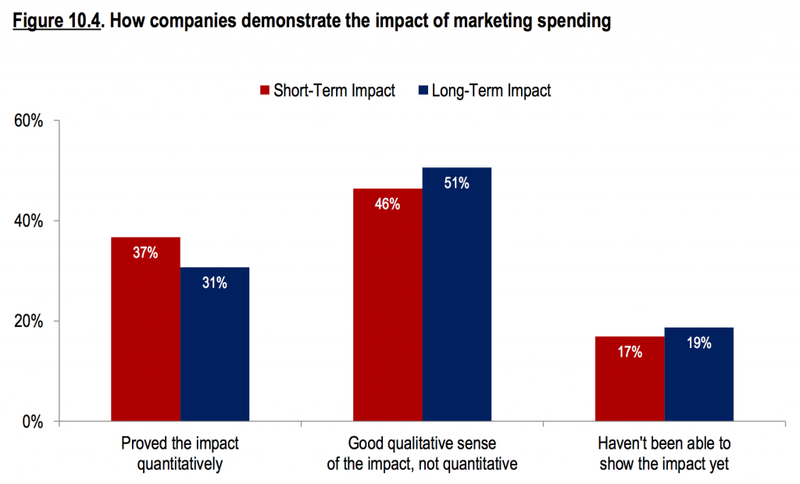 According to The CMO Survey from Duke University’s Fuqua School of Business, only 37 percent of CMOs in the United States feel they can prove the short-term impact of marketing spend quantitatively. It doesn’t get any better in the long-run — only 31 percent reported confidence in proving the long-term impact quantitatively. This means that 63 percent of marketers can’t quantitatively prove their impact in the short-term and 69 percent can’t prove it in the long-term. These surprising figures become easier to understand when we consider the many factors that affect marketing ROI in the long-term. In a traditional financial sense, ROI is defined as a ratio of net revenue and cost. So learning how to calculate ROI for marketing activities becomes a matter of simple arithmetic. Subtract the cost of a campaign from its net profit, then divide by the campaign cost, and you have marketing campaign ROI in its most basic form. This revenue versus cost ROI ratio, however, becomes more complicated for marketing initiatives as a campaign’s timeframe gets longer. Consider, for example, the long-term investment in content marketing or paid advertising. In all likelihood, a single blog post or banner ad won’t immediately lead to a sale. However, as the number of interactions from a consistent ad or content marketing campaign increase over time, their impact on purchasing decisions will accumulate. This builds momentum for a single purchase, or even repeat purchases. When considering how to calculate ROI for marketing activities by your brand, remember that there are many unaccounted variables that can influence your formula’s outcome. Which leads to three often forgotten ROI factors: brand awareness, customer lifetime value, and touch points. Marketing activities aimed at brand awareness often have an aggregate effect that — if measured on too-short a time-frame — will contradict their overall impact on ROI. For this reason, gains in brand awareness are typically measured according to leading metrics such as impressions, clicks, and interactions. These leading metrics measure initial customer engagement with your content on each channel, and can be optimized daily. ROI metrics, on the other hand, are metrics that attribute revenue to a specific marketing activity or campaign. Optimizing return on investment across various channels is a cyclical rather than linear process. Measuring and optimizing leading metrics on each marketing channel provides early indicators of success (or failure) of marketing campaigns to better track and predict their cumulative impact on customers’ purchasing decisions in the long run. Three out of four global marketers reported that customer lifetime value (CLV) is an important metric for their organization, according to a report from Econsultancy and Sitecore. The high value of CLV is understandable given its direct ties to revenue and ROI. Often, marketing departments have tunnel vision when it comes to driving buyers to convert on their website, so much so that a single shopper’s long-term value is overlooked. Customer lifetime value, however, is a predictive metric that forecasts the total future value a customer is projected to drive for a company over the course of their entire life. When you reconsider the revenue versus cost ROI formula, it’s clear that an understanding of CLV is integral to determining the upfront costs to attract and convert new leads, and the investment required to keep and grow existing customers. Another factor to consider when calculating ROI is the number of marketing touch points in the average buyer’s journey. Unfortunately, marketing is not analogous to baiting a hook, tossing it into a lake, and reeling in a customer. It takes a net of interwoven marketing efforts and touch points to create resonance and ultimately influence a customer’s purchasing decision. The typical number of touches it takes to close a deal varies across the board, but in almost every case it’s greater than one. While the revenue from a single sale is ultimately known, how do you assign value to the host of touch points that influenced the deal along the way? Whether you use single-touch or multi-touch attribution, the branching of attribution across multiple touch points complicates the net revenue to cost ROI calculation. The key to learning how to calculate the ROI of marketing activities is marketing attribution. Looking for social media or content ROI? 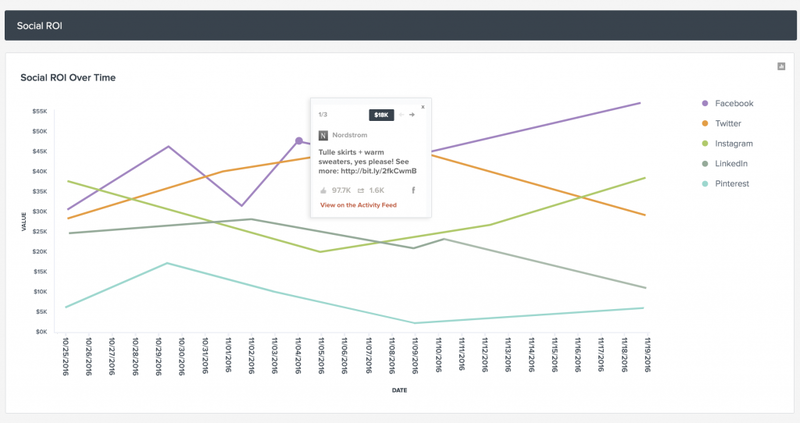 Track your impact on revenue by channel, campaign, and individual post by using social media and content marketing attribution. Having the right marketing analytics tool in place can help you track and report on marketing ROI. In a multi-touch model, you can account for every marketing activity that has influenced a sale. This way, marketing ROI no longer relies on leading indicators to predict success. Rather, it can be proven with data-backed insights that tie your marketing efforts directly to revenue. Figuring out how to calculate ROI for marketing activities goes beyond looking at dollars-out versus dollars-in. There are many ways to draw the line of success in your marketing sand, and each means of analysis offers different advantages and insights. The complications in calculating return on investment can be navigated based on your marketing goals. Define what a successful campaign looks like quantitatively, use marketing attribution to track campaign impact, and gather the data you need to connect the dots. Proving the value of social media and content is difficult — but not impossible. We created The Marketer’s Field Guide to Social and Content Marketing Attribution to show you how to prove your impact. Get your free copy now! Social and Content Marketing Attribution: The Marketer's Field GuideYes! I want this!